I was browsing and looking online for some outdoor décor when I saw at my mail about the $1 sale and the Huge Charity kit from Digiscrappers Brasil so I went over to their site and read more about it. I was touched by the story of sick Leonardo so I thought I have to buy the kit to help him and his family in my own little way. All proceeds of the My WISH FOR YOU collab kit will go directly to the family of Leonardo. Here is the kit that I bought. It was actually a mega kit with tons of papers, elements and alphas from Digiscrappers Brasil designers. It costs $10.99, you too can share and enjoy this kit. 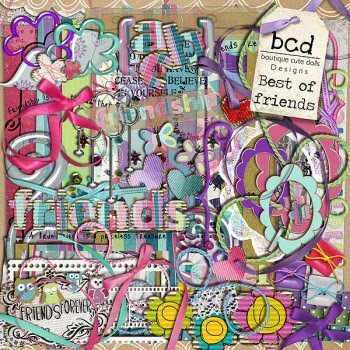 I also bought this Best of Friends by BCD Designs for only $1 during their Dollar Day yesterday. Now I can't wait to use these kits on my digi-scrapping!